When 12,000 dietitians gather together for the annual meeting of the Academy of Nutrition and Dietetics, let me tell you: food is on everyone’s mind. 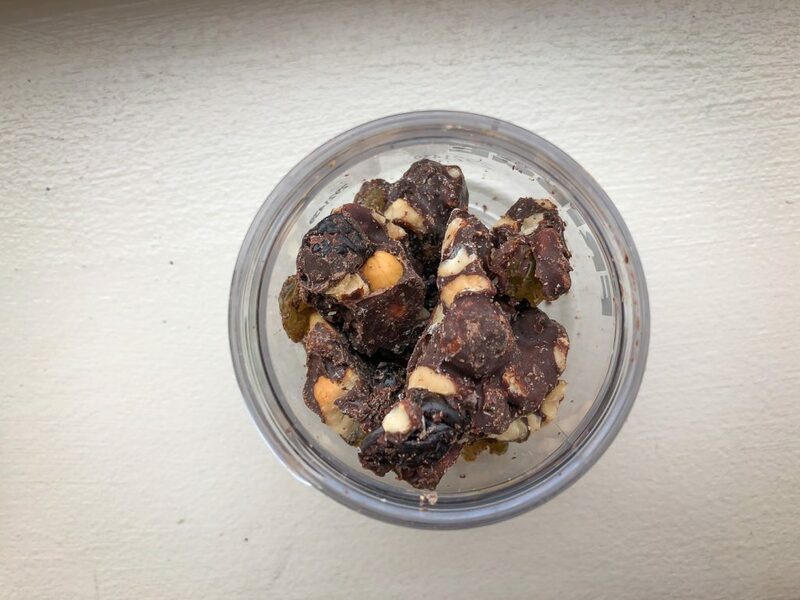 We’re thinking about food during the educational sessions (from a scientific perspective), while we’re strolling through the exhibitor hall (from a free sample perspective), and all the time in between (from a personal satiety perspective). This year the meeting was in Chicago, so there was no shortage of cool restaurants near and far to check out. So I was surprised and delighted to find myself eating breakfast from a vending machine in my hotel. Twice. Farmer’s Fridge is like no vending machine I’ve seen before. 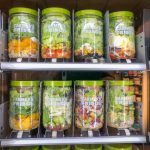 It’s filled with salads, puddings, trailmixes, and oatmeals alongside tofu cubes and hard boiled eggs! 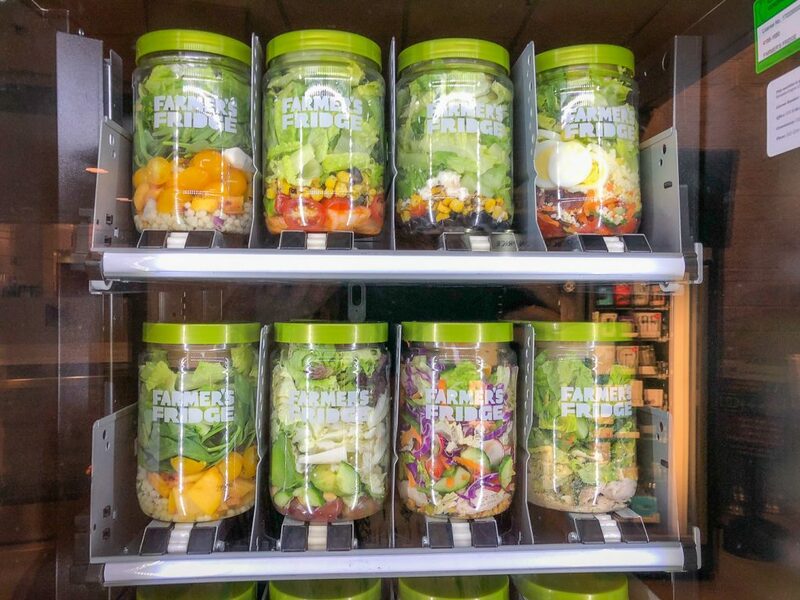 All the food is made fresh locally in Chicago and the machines are stocked every morning. I would likely never have found it if not for an ad in the elevator with an appetizing photograph. I ended up asking the front desk where I could find Farmer’s Fridge, assuming it was an eatery inside their hotel. They directed me down a long hallway where it was tucked next to another vending machine selling earbuds and charging cords. 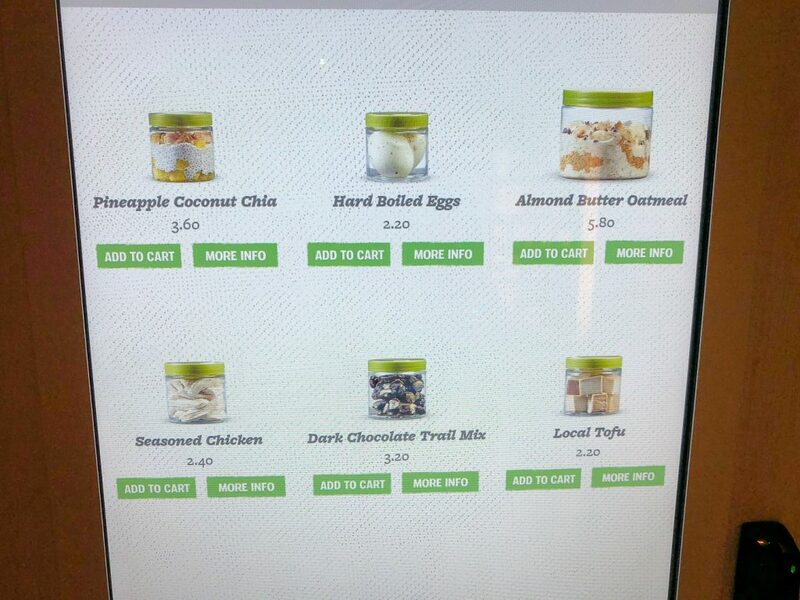 Just look at these options! 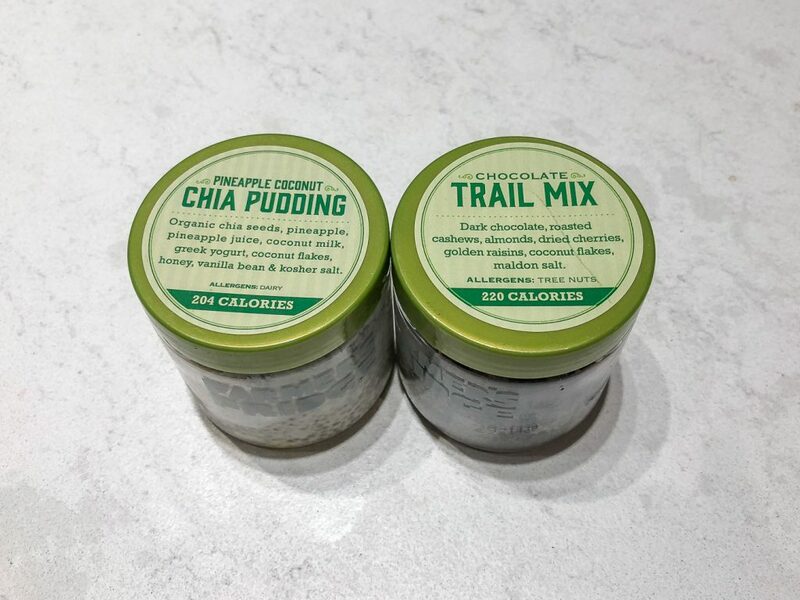 The first day I checked it out, I selected the Pineapple Coconut Chia Pudding and the Chocolate Trailmix. Together it cost just under $7.00. It just so happens I don’t even like pudding! 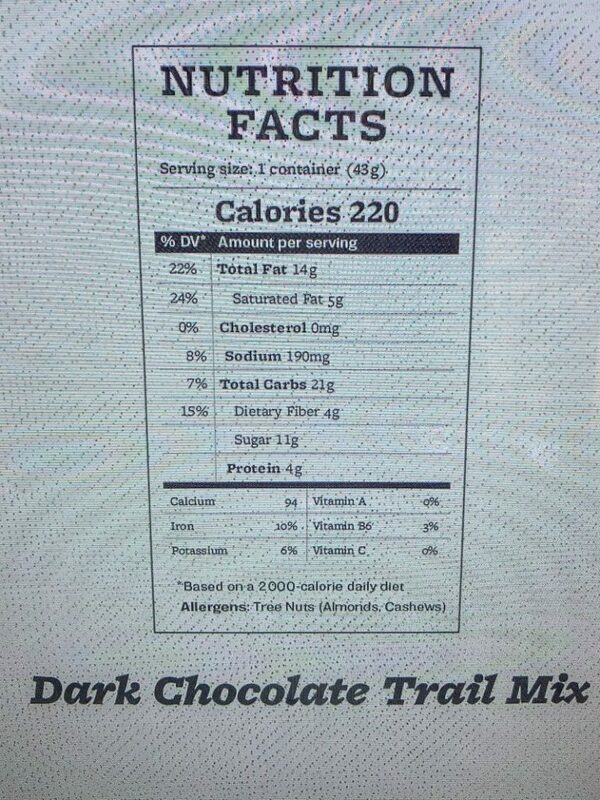 But this flavor combination intrigued me so I gave it a go. Turns out it was extraordinarily thick and the texture was surprisingly wonderful. The portion couldn’t have been more ideal, and the tangy pineapple plus the creamy coconut milk and yogurt made for a flavor combination that was spot on. A little coconut on top for crunch, and a stolen plastic spoon from the nearby coffee bar, and I had darn near the perfect breakfast. 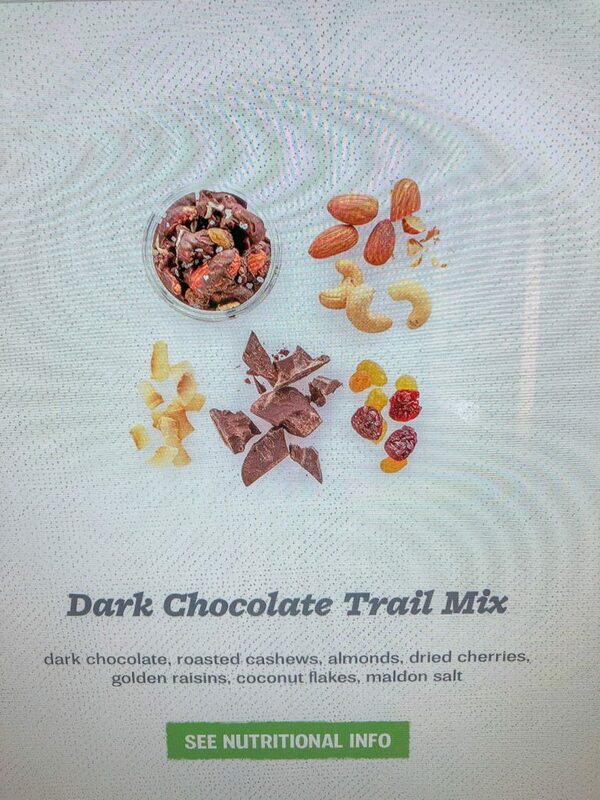 The trailmix was just OK, and I’m not sure I would buy it again, but I commend them for choosing good ingredients for this chocolatey treat. However, I’m so happy with the pudding, and the fact that I willingly put pudding in my mouth, I’ve already tried recreating the recipe at home. Stay tuned. If I can perfect it I’ll definitely put it on the blog. 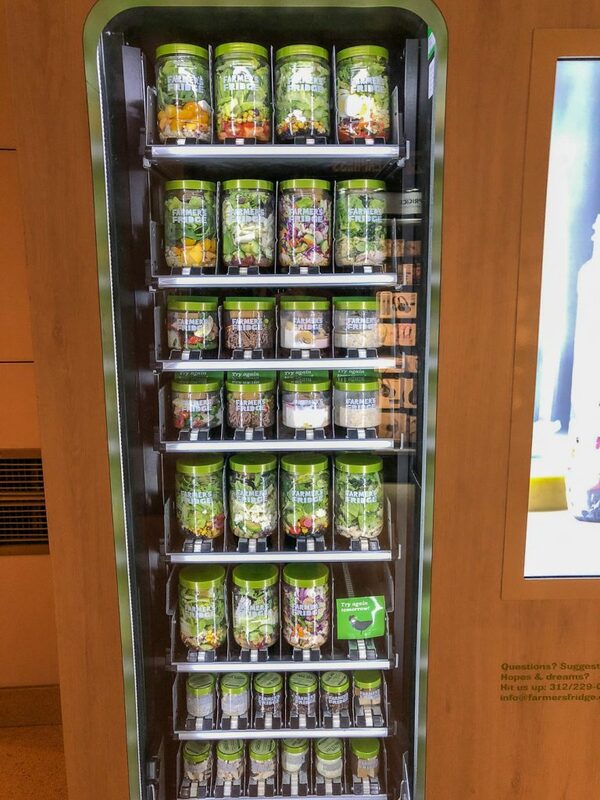 My traveling buddy (and roommate) had been in search of oatmeal the previous morning so I suggested she check out Farmer’s Fridge for her next breakfast. 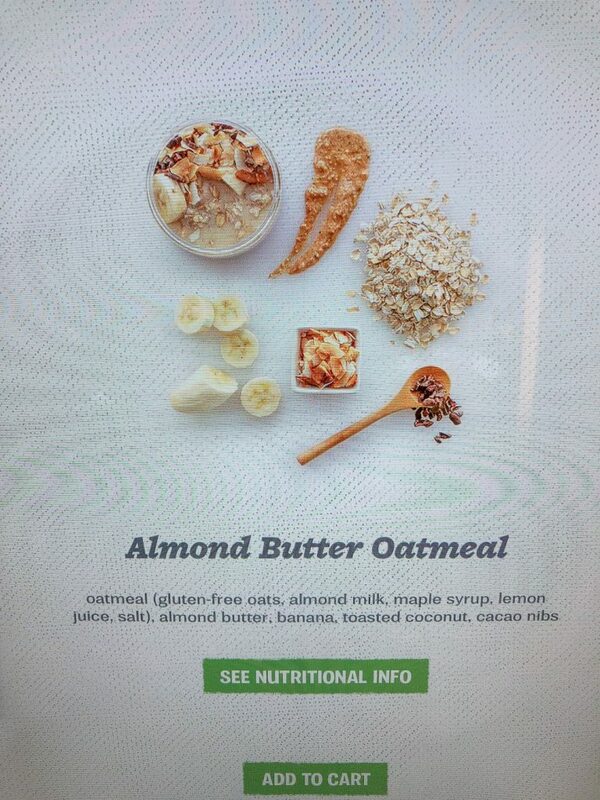 She got the Almond Butter Oatmeal (a.k.a. The Nutty Monkey) and was quite satisfied. 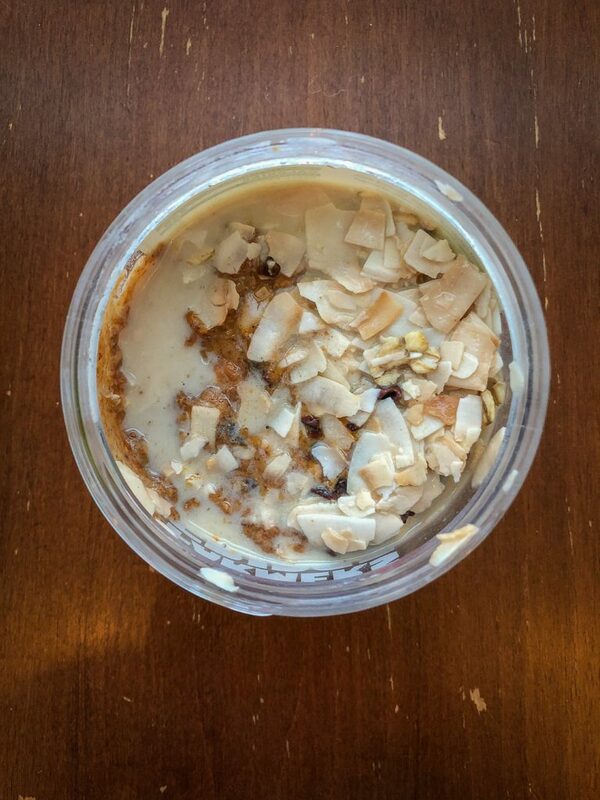 The next morning I opted for the oatmeal based on my friend’s recommendation. 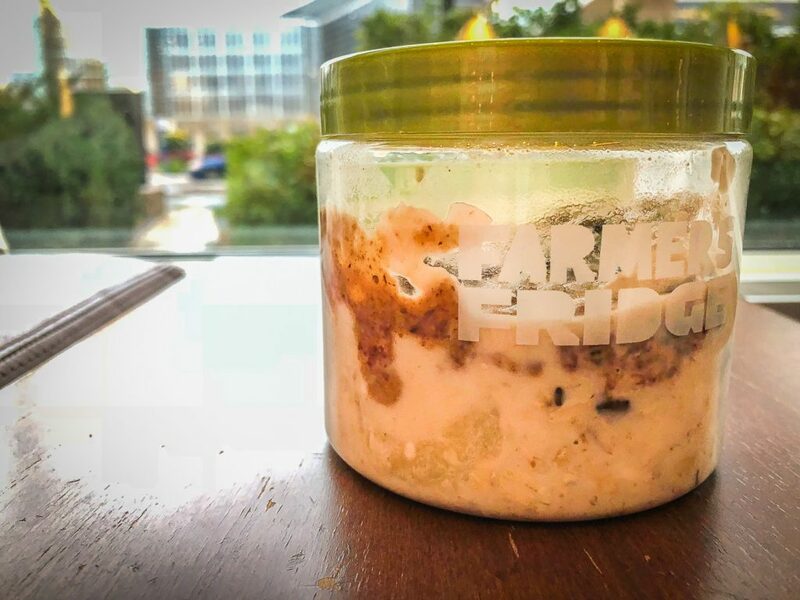 It was cold, though I suppose I could have microwaved it, so I just enjoyed it like overnight oats (where you soak oats in milk or juice overnight to soften them instead of cooking them the old fashioned way). The nutrition facts are rather favorable: 440 calories, 10 g fiber, 15 g protein, 40% Daily Value for calcium, 20% Daily Value for iron, and it’s also vegan! I would have loved to try the Soba Noodles (soba noodles, carrots, edamame, scallions, peanuts, sesame seeds & peanut dressing) or the seasonal Peach Caprese salad (couscous, red onion, fresh basil, olive oil, salt, black pepper, romaine lettuce, peaches, yellow tomatoes, fresh mozzarella cheese, spinach, pine nuts & balsamic vinaigrette), especially with the option of topping either one with tofu. But I wanted to actually experience some of the Windy City’s restaurant food too. And leave room in my stomach for the myriad free samples like Sunmaid Sour Watermelon Flavored Golden Raisins, Cocoburg Ginger Teriyaki Coconut Jerky, or High Brew Black and Bold Cold-Brew Coffee. Farmer’s Fridge was definitely a popular destination in my hotel. Each day that I checked (around 5:00 pm) it was either completely or mostly sold out. And the delivery folks must come early, because my machine was fully loaded again the next morning by 7:15 am. 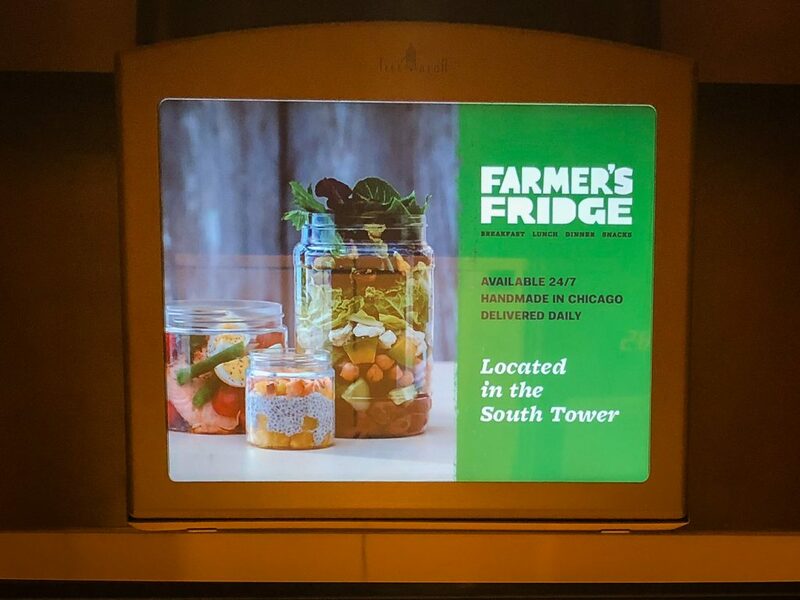 Farmer’s Fridge has a ton of locations in Chicago, including medical centers, colleges, and 7-eleven stores; essentially the perfect places to place healthy options in front of hungry, hurried people. They’re also in Milwaukee, but I discovered mine on the first floor of the Hyatt Regency McCormick Place. One of the most common reasons people say eating healthy is too hard is because it isn’t as convenient as say, the drive through of a fast food restaurant. Or they say it’s cost prohibitive. That’s why Farmer’s Fridge is such an exciting find for this dietitian! Easy, quick, fresh, healthy, tasty, plant-based, and reasonably priced. I don’t think 12,000 dietitians can argue with that. 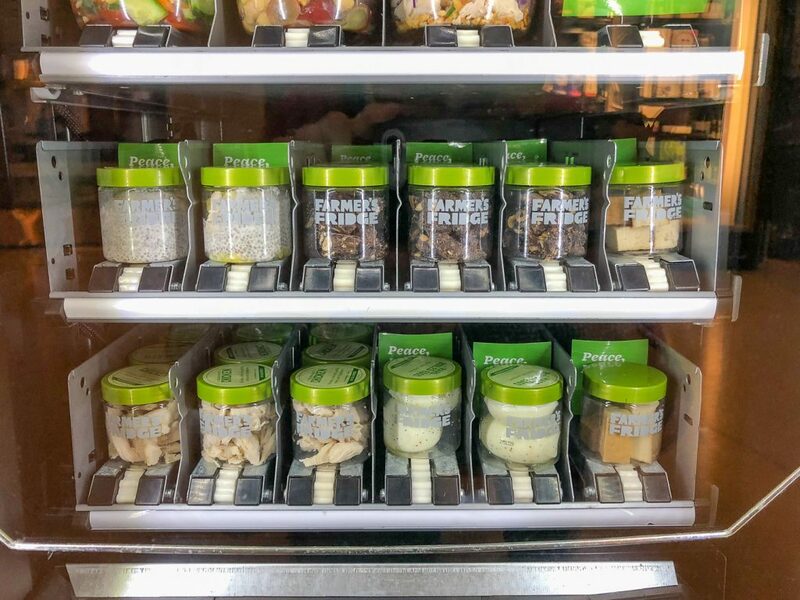 Do you have access to a fully stocked fridge like this where you work or travel? I’m definitely going to be on the lookout now! This is so cool! 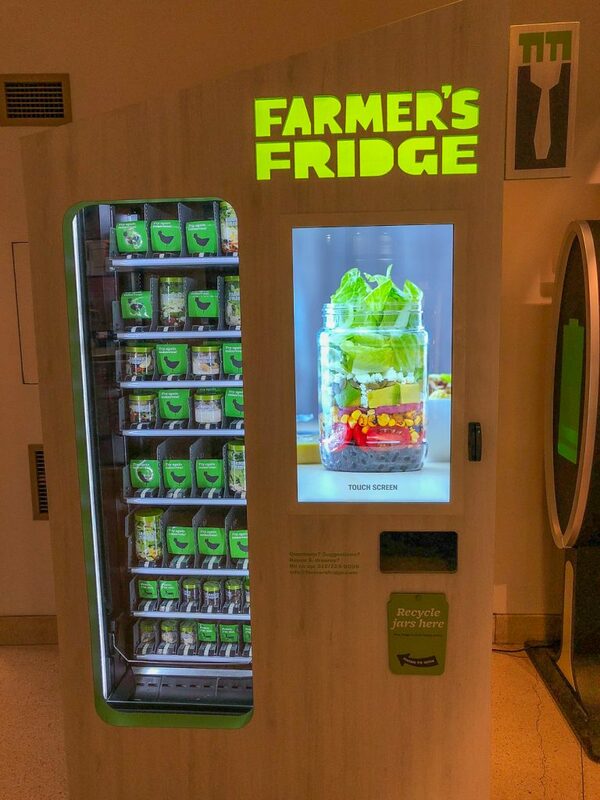 Hopefully Farmer’s Fridge expands a bit further across the Midwest to Minneapolis, I’d love to have this as an option for a work snack or meal. 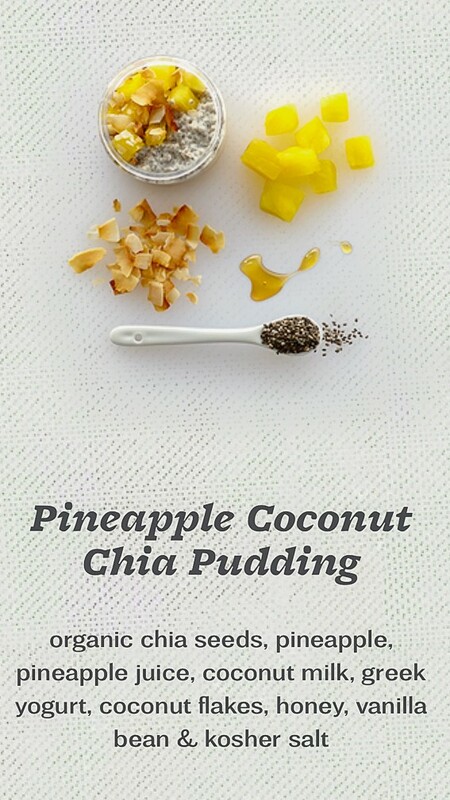 I’m a big fan of chia pudding, fingers crossed your recipe testing is successful and a future blog post will feature your take on the pineapple coconut pudding. Hi Stacy. I tried recreating the pudding once and it wasn’t quite right. I just tried a second batch and was quite happy. I think I’m getting close. Stay tuned! This is SO cool. I so wish they had something like this at Skagit Valley College! Well, I’m completely blown away- this looks amazing! And to know that the concept can work really makes me happy. Thanks for sharing. I know! Seems like something insignificant like a new kind of vending machine shouldn’t be that exciting but it REALLY is! Especially for us nutrition-minded folk. Hi Cicily. Thanks for your comment. I totally agree!